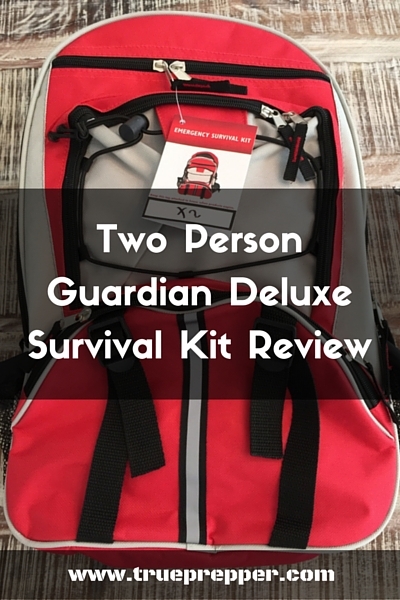 The 2-Person Guardian Deluxe Survival Kit is available at Living Rational, and cost a meager $109.99 at the time of this review. To put it bluntly, this kit covers all of the bases for a very little amount of investment. By buying a prebuilt survival kit, you save not only money, but time as well. 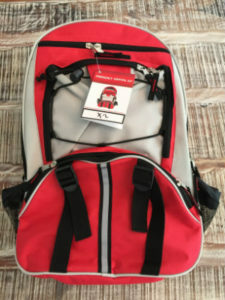 I have built and maintained a bug out bag meticulously- but if I had simply started with this kit and expanded or upgraded components as I saw fit, it would of made my bag much more complete earlier on. You may ask “Why would you save money, don’t the suppliers of the kit have a profit margin?”, and I would reply “Of course!” The suppliers buy all of the components in bulk, and then save with economies of scale. That is why they can sell you a prebuilt kit with many different components cheaper than you could buy the individual components yourself. Sure there are some quality concessions on the Guardian Deluxe Survival Kit, but we will get to that later on in the review. This is the best part of the kit, in my opinion. 72 hours worth of portable basic sustenance can be a game changer when SHTF. The water pouches are robust and hard to puncture, so leaks should not be a problem. The ration bars have a tolerable taste, and a lengthy expiration date of five years. While I can't talk about other vendor's of the Guardian kits, Living Rational does a pretty good job of providing kits with recent manufacturing dates. My ration bars were dated 5/2016 and I received the kit 6/2016, so that is about as good as it gets for longevity of the ration bars. The tablets extend your water supply by quite a bit. The Guardian Survival Kit is missing a container, so that may be an item you want to add. Be sure it is 1L or 2L big so the math is easy on the purification tablets. So many tools in such an inexpensive, small kit. The squeeze flashlight is bright, small, and lightweight. The candle is talked about later in this review, and should probably be removed. 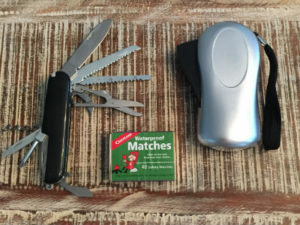 The sewing kit is always a good addition to survival kits, and this one covers all the basics. While the AM/FM Radio does not pick up NOAA weather band, under most disasters and emergencies, the emergency broadcast will take over the AM/FM channels as well. 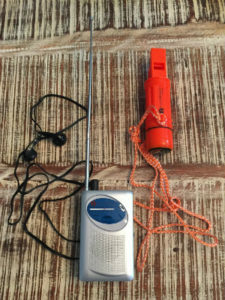 While the radio is great for listening, the survival whistle can get you heard. It is especially useful for earthquakes, to signal for rescue if you become trapped by debris. I personally prefer mylar blankets, a tarp, duct tape, and cordage for shelter purposes, and these are basically the same thing, but preformed into a sleeping bag. They are large and roomy and should fit any body type. The downside of mylar is how noisy it is, but they are the best at what they do for their weight. The NIOSH N95 mask and the safety goggles are a refreshing addition to this kit. Useful during epidemics, volcanoes, and nuclear incidents, these are expedient lightweight items that all disaster kits should contain. The first aid kit is pretty bare-bones, and is mostly bandages. This may be an easy area to upgrade to kit, if you are looking to have better medical supplies. Hygiene is important for morale, and to assist in staving off infections. These kits are so comprehensive that they would not be out of place as hotel supplies. Wet naps are the king of hygiene, as I have discovered in the military. Poker, Rummy, Gin, Bridge, Solitaire, Blackjack, Hearts, even Go-Fish… everyone knows a card game. During stressful times, which would probably be any point at which you are using this kit, are a great time to break out a deck of cards and boost morale. 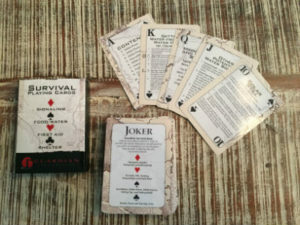 As a bonus, this deck of cards has survival tips printed on every card with the Ace as a table of contents. 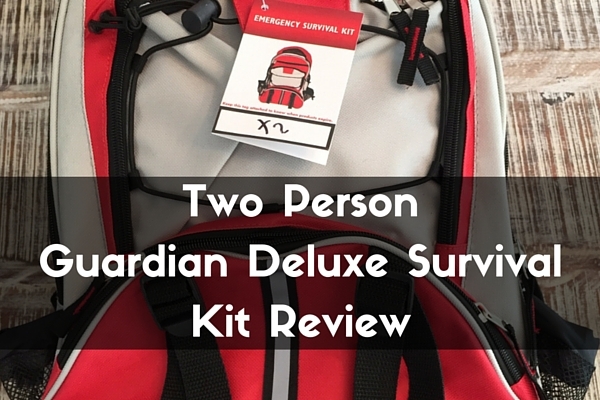 The portability of the Guardian Deluxe Survival Kit is one of it’s biggest assets. The included backpack comfortably fits all the gear, with plenty of room to spare for added necessities you may need to stuff in quickly. There are many pockets, and several straps that allow you to load this pack up well beyond it’s shipped weight. The rest of the gear comes in plastic bags inside the backpack, which could be re-purposed if needed. I had to throw out the infectious waste bags due to the candle oil, but it was large and could hold a lot of ‘waste’. 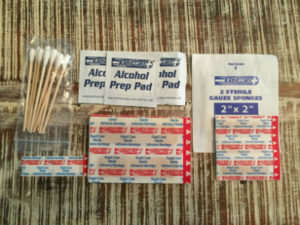 The cost of this emergency survival kit is great, since it is much cheaper than all the separate components. 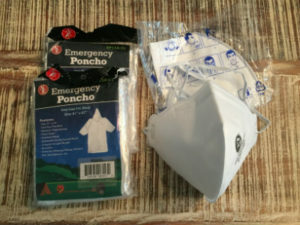 It contains the essentials for most disasters or emergency situations. 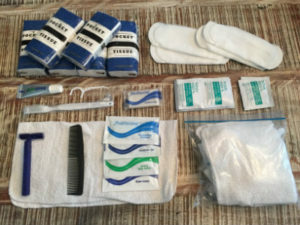 The Deluxe Survival Kit is particularly well suited for beginning preppers looking to start off with an easy 72 hour disaster kit that can double as a Bug Out Bag. It makes a great kit for redundancy purposes as well. The kit makes for a great gift, especially if someone is starting on their own. If you have a kid going to college, this kit would make a perfect tag-along for them as they strike out on their own. A little disaster security can go a long way, and it provides back ups for all hygiene essentials as well. 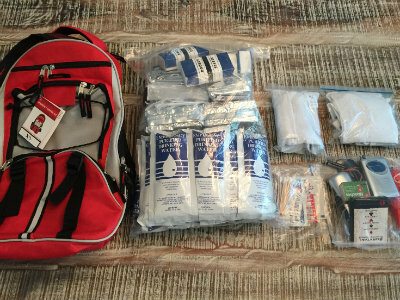 You may be surprised when something as simple as gifting an emergency survival kit can spark an interest in prepping and preparedness. This survival kit includes many items to increase your functionality during a disaster or emergency. The one item it could definitely do without, however, is the 30 hour candle. While candles are important, I would swap it out immediately with tea light candles for one major reason: durability. When the kit arrived on my doorstep, the shipping box was discolored. 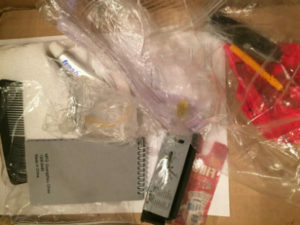 When I opened up the kit, the candle fluid had leaked out and soaked some of the items, the backpack, and the shipping box. The backpack was fine, and did not retain the fluid. Some of the items had to be thrown out, even though the oil soaked notepad may have made a good fire starter. 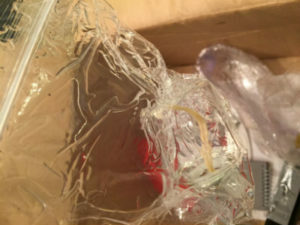 The candle spilled during shipping simply by having the cap fall off. If you order this kit, I strongly encourage you to swap the candle for a non-fluid candle, or simply select a Guardian Kit that does not include the candle since there are many different options available. The quality of the tools included is manageable, especially for how infrequent the use may be. I would suggest upgrading to better tools when you get the chance, such as a Gerber or Leatherman multi-tool if you plan on using this kit for more than occasional emergencies. 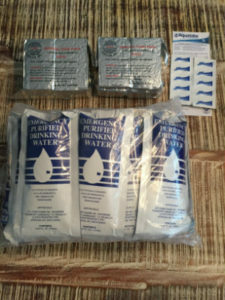 At TruePrepper we recommend the Guardian Deluxe Survival Kit as a starter bug out bag, a stand alone disaster kit, or as a gift for someone in need of a little preparedness. It's versatility and functionality for the dollar makes it a great kit to get by during disasters and emergencies. Further down the road, you may want to consider upgrading individual items with better durability and less compromising quality. 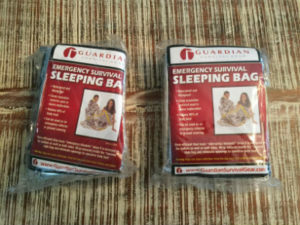 LivingRational.com provided TruePrepper with the 2-Person Guardian Deluxe Survival Kit at no cost so we could conduct our review. Our disclosure statement is here, and on the bottom of every page.